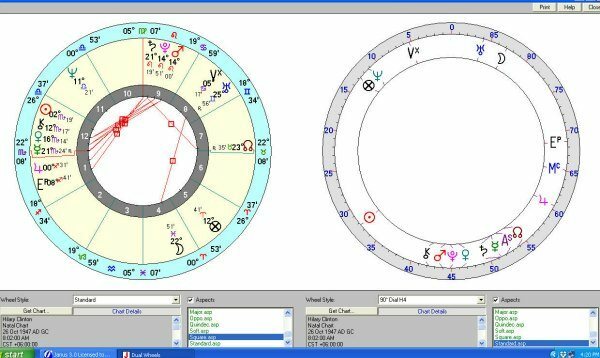 Let us take a look at the horoscope of Hillary Clinton for the 2016 United States election and see why she failed in her bid to run for the White House. This is not the first time she has lost in the race for President. She was out manoeuvred by Barack Obama in 2008; however she did go on to play an important role in his administration including Secretary of State. Hillary Rodham Clinton was born 26 October, 1947 in Chicago to parents Hugh and Dorothy Rodham. She has two younger brothers. Her birth time is given as 8.02 am but some astrologers say this is dirty data; however, with the use of Cosmobiology we can still get over 85 per cent of the information we need without a time of birth. The only things that change are the Ascendant, Midheaven, Vertex and the East Point. On the day she was born the Sun was in Scorpio and the Moon in the sign of Pisces. Mercury and Venus were also in the sign of Scorpio. This is a very interesting combination as it adds many different components to the personality. One certainly has a magnetic charm but can also be sensitive, impressionable and idealistic. Because we have two water signs, Clinton has the uncanny knack of being able to quickly adapt like a chameleon. She takes on the colour of her surroundings. Role playing is common and she is a superb actress. People with this combination have to be careful that they don’t believe in their own publicity in the process of trying to be all things to all people. Mars in Leo fills one with a lust for life, pride and passion governing one’s actions and the large ego demands applause. Growing up as a child, Clinton was very popular. Her teachers could see her potential. She was a bright student and gained several degrees at University including a law degree. There are two interesting patterns that show up on the 90 degree chart. The first one is Mars/Pluto/Venus indicating her rise to power and her popularity and the second one is Saturn/Mercury/Ascendant/Node which sometimes makes one preoccupied with their own thoughts and ideas. Even if the time is wrong, only the Ascendant will change so either way it is still a very powerful aspect and a relationship with the public. It may also bring with it certain limitations in her rise to power. This pattern can give a major disappointment in life which of course she has now had. This pattern may also be why she misjudged the mood of the ordinary person on the street, preferring to run her own race instead. 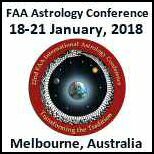 Mundane or political astrology is devoted to the study of planetary cycles and patterns reflected in world events, cultural trends and collective phenomena in general. When I casting a chart for an election I use the closing time, because the deed is done. However, there are times when one needs to use the opening time such as in a horse race when the end result can sometimes be changed by the circumstances of the moment. In the 2016 United States election chart, because there are so many time zones across the country. I chose the 8.00pm closing time for Washington, but before I do the chart of an election I always look at the chart of the major candidates to the chart of the country. For this exercise I used the US Rudyer chart which is 5.10 pm on 4th July 1776 and find I get good results. If we take a look at that chart there is not a great deal showing up other than Clinton’s natal Moon to America’s Neptune/Mars, across to America’s Node. Not surprisingly many US presidents have planets or personal points to this position that tell a story. Roosevelt had Venus/Saturn to the Node across to the Neptune/Mars and he died in office. Obama had natal Mars to the Mars/Neptune and hence had trouble implementing many of his policies. 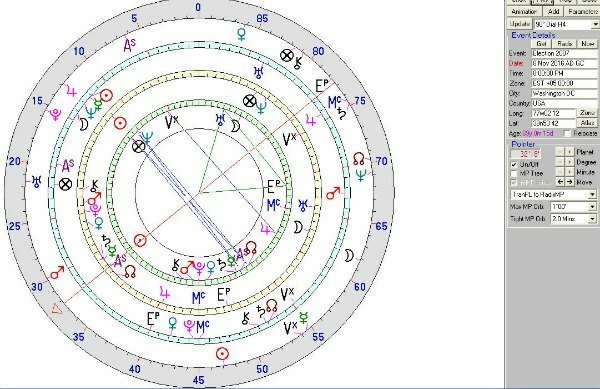 Taking this example of the Moon in Pisces to the Mars Neptune of America’s chart, in Hillary’s case the aspect was not strong enough to bring her the power of the White House, especially when her opponent has the Sun/Moon and Node to this same degree. Another tool for predicting an outcome in close contests is to use the weighting system of the planets. In this case the Sun, Moon and Node in Trump’s chart take precedence over just the Moon in Hillary’s chart to that of the country. The other chart we will look at is the chart for Hillary on the election date. 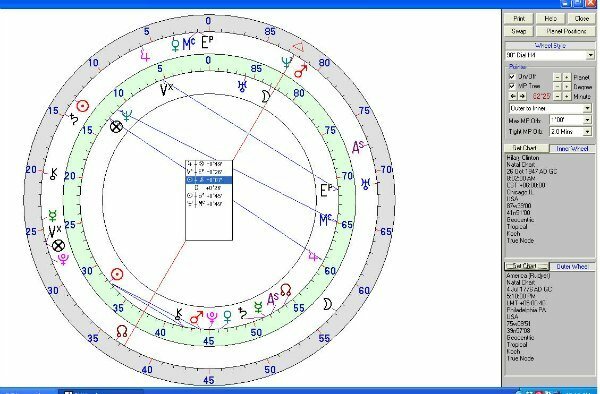 I have put the pointer on her natal Sun on the Quad chart which shows up the Saturn/Mercury/Ascendant/Node had formed a mid-point to this degree which can be a very uncomfortable position and sometimes indicates a separation of power. Even if we allow for a wrong time of birth and take the Ascendant out of the equation the story is still very similar. The interesting thing about the time for this chart which could now give a clue to whether or not the time is correct is that by solar arc the Mid Heaven has come to the degree of Pluto. Whilst this can bring the attainment of power on the plus side, on the minus side it can bring sudden ruin through the misuse of power. So; did the email scandal, play a part here? There was one positive aspect on the day of the election for Mrs Clinton which was the transiting Sun conjunct her natal Venus and of course she did win the popular vote. In hindsight it may look easy but it is not. One must do a lot of homework to get an answer. Many astrologers used the trines and sextiles which are not strong aspects. Others used the transneptunians and the asteroids but they did not get it right either. Cosmobiology uses a ninety degree chart which shows the conjunctions, square, oppositions, Semi-Squares and Sesqui Quadrates. These are the action aspects and therefore show the changes coming up in our lives. Some astrologers list the last two as minor aspects but in all my research they are the most powerful. Never underestimate their power however they are hard to see on the 360 degree chart. I did every level of chart that I could, but whichever way I looked at them, I could not see Hillary Clinton in the White House. It wasn’t just the astrologers that got the 2016 United States election result wrong. It was also the press and the journalists who talked their own narrative. Even on the day of the election the press were talking up a Hillary win by at least 87%. I think many people under estimated the power of Neptune, planet of fantasy, confusion, lack of clarity and disillusionment in the sign of Pisces which can be prone to all of the above and got caught up in a web of intrigue. I think it is providential that the movie, “La La Land” is wining many awards in America at the moment. We even saw controversy at the Oscars when the film was named the wrong winner. Whenever I have a new client I always say “I will not tell you what you want to hear, I will tell you what I see”, and back in September 2015 I saw that Trump would win the election. I have my prediction on video at a public speaking course that I was involved in that year. Just before Uranus, planet of change and revolution finishes its journey through Aries and goes into Taurus, the sign of stability, a new era has begun for the United States. Under their democratic process whether the Hillary voters like it or not, Donald Trump has won and has a majority in all houses. Life is just a series of cycles and if you check out history you will find that it does often repeat itself, albeit in a similar way. Franklin D Roosevelt, son of wealthy prominent parents, came to power as the thirty second American president when he won the election in 1932 in the height of the great depression. His promise was a new deal. “This great nation” he said “will endure as it has endured, will revive and will prosper – the only thing we have to fear, is fear itself”. Roosevelt’s first task once he took over was to put the nation back on the road to recovery through his new deals programs. Later in May 1935, the Supreme Court declared some of his “New Deal” programs were unconstitutional but in the interim these measures had breathed life back into the economy. Roosevelt died in office on April 12th 1945. There is a lesson to be learned from this quote by Anthony Robbins… “to effectively communicate, we must realise that we are all different in the way we perceive the world and use this understanding as a guide to our communication with others”. 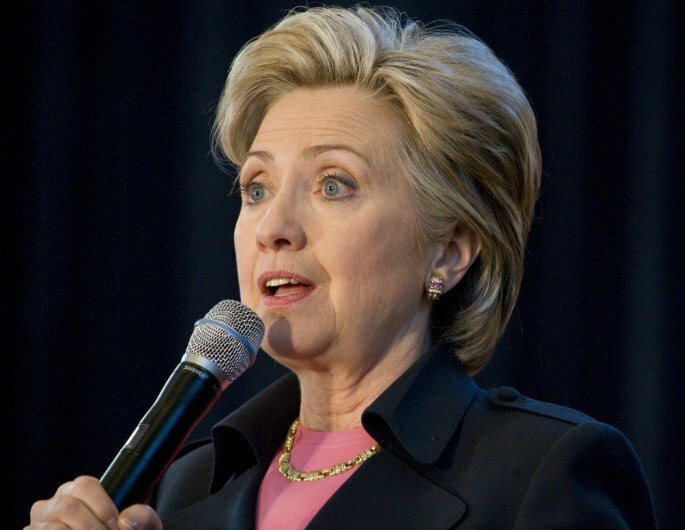 Hillary Clinton has some difficult aspects coming up in the next year or so to deal with. Whether she was president or not, the chart still tells us there are tough times ahead so; it will be interesting to see how these play out.